University College Dublin Press, 2009, xiv + 216 pp. 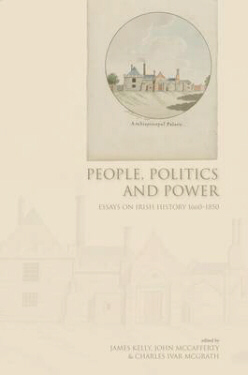 People, Politics and Power presents some of the most recent thinking on politics and society in Ireland from the restoration to the Great Famine. Written by students and colleagues of James I. McGuire, the essays reflect McGuire's scholarly engagement with the interaction between the individual and the political arena, the Church of Ireland, the exercise of power in all its multifarious manifestations, and political biography. Each essay presents a new reading of the career of an emblematic figure, an important moment or a significant trend or issue, ranging across topics such as the legislative, the politics of persuasion, life within the law and beyond it, constitutional change, religion and ideology. "In an elegant, persuasive account of Catholic attitudes towards the 1774 oath of allegiance (to the Hanoverian king) Vincent Morley makes an analogous point even more forthrightly: 'ideology has a life of its own' ... Jacobite sentiment long survived all prospect of a Stuart restoration." Jim Smyth, Irish Studies Review, May 2010. "Vincent Morley likewise discusses the continued importance of Jacobitism, even after the threat of a Stuart restoration had all but vanished. He focuses on a pamphlet debate provoked by an oath of allegiance in 1774 designed to allow "loyal" Catholics to publicly display their commitment to the Hanoverian dynasty and concludes that debates over the interpretation of the oath were based on the assumption of enduring loyalty to the Stuart dynasty among many Catholics." Padhraig Higgins, Journal of British Studies, January 2011. "Vincent Morley returns to the controversial question of whether or not Jacobite sympathies persisted among Irish Catholics into the 1770s ... As a Festschrift, this collection has unusual coherence and contains several pieces of permanent value." Toby Barnard, English Historical Review, June 2011.